An exquisite collection of artefacts, antiques and artworks can now be found deep in the African wilderness. The Retreat, located in the northern Selous in Tanzania, is home to a range of one off treasures from around the globe with each unusual piece handpicked by the owner. The main house, ‘The Fort’ is perfectly positioned on the site of a former military observation point from World War 1 with many of the furniture pieces relating to this time in history. The lodge’s philosophy is based on respect for the power of ancient traditions, local communities, natural materials and untouched nature. The Retreat has been constructed to harmonise with the raw habitat and the five physical elements of the natural world are applied throughout. Water, wood, fire, earth and metal and principles of Feng Shui are apparent to ensure that guests feel completely at one with their surroundings. 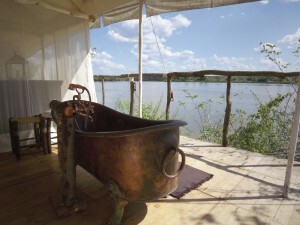 The Retreat offers twelve exquisite suites that lie in total seclusion seven hours away from the nearest camp. The Selous is the largest protected wildlife sanctuary in Africa and is one of the last remaining areas where nature remains virtually undisturbed. The beautiful tented suites are mounted on raised teak wood platforms and each comes with its own private deck and outdoor bath allowing couples to savour their own experience of the surrounding wilderness. Each suite uses natural materials including silk mosquito nets and curtains, and locally sourced crafts creating the ultimate feeling of laid back luxury. The canvas interiors are handmade to reflect the stars of the African sky, creating a romantic atmosphere whether inside or out. The transparent walls in the suites invite the sights and sounds of the African night, allowing guests to feel even closer to nature. The ornate tables in the suites are made from forest marble and engraved with semi precious stones which have been carved into shapes of the animals that surround the lodge. 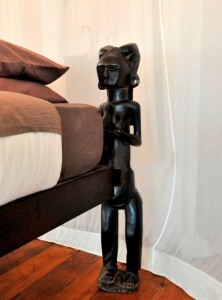 The beds have all been hand carved to represent the initiation beds from the nearby Makonde tribe. Bed posts are carved individually in the shape of a man or woman’s body representing the transition from childhood to adulthood in the tribe. The freestanding baths were handmade in Morocco by two talented men the owner met on her travels to Marrakech. The baths are made from brass and copper and represent the metal element of feng shui. 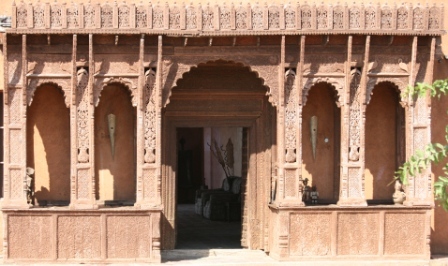 The main doors in The Fort are colossal and vast. They were once located in a Maharaja’s palace in Rajasthan, India and were bought over to Tanzania during the First World War. The courtyard of The Fort is home to an exquisite water feature made of black marble and semi precious stones reflecting the element ‘earth’. The same stones are also used in the spa for healing and crystal ball massages. The Retreat takes guests on an individual journey exploring this unique and beautiful part of untouched Africa. It offers a chance for guests to feel connected to the history of the country through the beautiful and individually chosen interiors of the lodge. Each item is handpicked to enhance the feeling of raw nature and blend in with The Retreat’s natural surroundings.